TVT Green Grease Formula is the perfect companion to complement the TVT Green Oil Additive. Lubricate all the metal moving parts of your vehicle with the stellar anti-friction performance of TVT Green. Reduce wear and increase performance of bearings and other moving parts. Works on any metal-to-metal contact points. TVT Green Oil Additive is a major breakthrough in lubrication technology to fight the friction and wear of metal components in engines. Within minutes of use you can hear and feel the difference TVT Green makes in your engine. You will notice reduced engine noise, reduced vibration, and improved fuel economy. Your engine just runs smoother with TVT Green Engine Oil Additive! 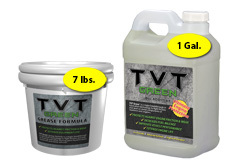 TVT Green - Bundle #1: Buy the Grease and Oil Additive together and save! Oil Additive - 1 gal. 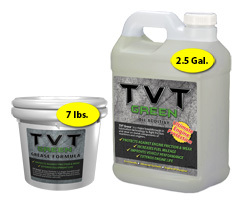 TVT Green - Bundle #2: Buy the Grease and Oil Additive together and save! Oil Additive - 2.5 gal. If you are having problems ordering online, please call us at the number below or email us at sales@tvtsales.com.